Battle Baptists celebrate after winning the National Christian Cup last May. Battle Baptist Football Club is in confident mood as it bids for a semi-final place in its defence of the National Christian Cup. 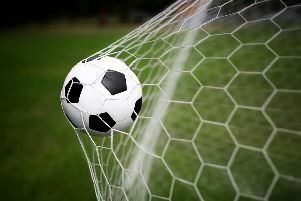 The Macron East Sussex Football League leaders will travel to Selhurst United in the quarter-finals of the prestigious national knockout competition tomorrow (Saturday). Battle manager Gary Walsh said: “We’re really excited. Everybody’s fit and raring to go, and we’re really looking forward to it. Battle have won all four of their games in all competitions since the turn of the year without conceding a goal, all of them away from home. One of those victories was a 5-0 success against St Albans Romans in the previous round. Beckenham-based Selhurst have scored 11 goals and conceded just one to reach this stage, winning 8-1 at home to Soul Church (Norwich) and 3-0 at home to FC Cornerstone (Stevenage). “I don’t know a great deal about them,” admitted Walsh. “Their name seems new to me in the competition, we’ve never played them before, but clearly they’ve got to this stage so we know that they’re going to be a force to be reckoned with. Walsh says a lot of the players still talk about Battle’s victory in last season’s final at The Valley, home of Charlton Athletic FC, and opponents mention it too. “We keep looking back to that day last May when we had such a great time and we want it again,” he went on. “A lot of the lads talk about it, and they’re going to battle and fight because they want it again. “Every time I make contact with our opposition they always mention it. The comment on Monday from the (Selhurst) guy when he emailed me was ‘we’re looking forward to it to measure ourselves against the national champions’. The winners of tomorrow’s quarter-final will face a long trip to the north-west in the last four to face opposition from Bolton or Liverpool. Apart from Adam Higgins-Gooch, Battle should be at full strength with Jake Rudwick and Dean Boyd having shaken off their injury concerns. The squad will leave Battle at 9.30am and should arrive in south east London in plenty of time for the 1.30pm kick-off. Battle’s scheduled league fixture at home to Crowhurst last weekend was postponed due to an unfit pitch, meaning they still haven’t played on their own turf since October.